Ann Malkin writes in response to an article in the December edition. 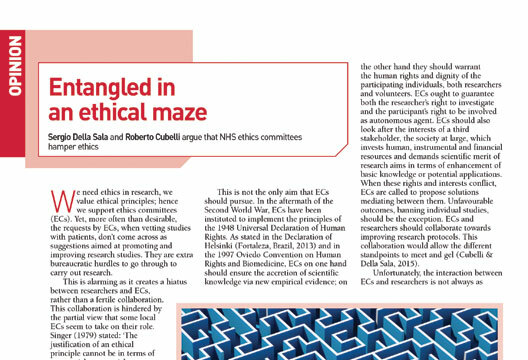 I was saddened to read the ‘Opinion’ piece by Della Sala and Cubelli (‘Entangled in an ethical maze’, December 2016) regarding the difficulties psychology researchers’ experience with NHS Research Ethics Committees (RECs/ECs). While they acknowledge that their view is partial and ‘does not apply to all ECs’, the tone of their article suggests that they view these difficulties as commonplace, and see ECs as a hindrance, rather than as a support, to psychology research. The authors take issue with the NHS Health Research Authority’s stated primary role as ‘protect(ing) and promot(ing) the interests of patients and the public in health research’. It appears to me that they fail to recognise that, while a significant aspect of this has to do with protecting participants from potential harm (which they acknowledge can be a risk even in research that does not involve new medicines), the other component of the role is that of supporting research that increases the body of knowledge, both within the basic science and in relation to the development of treatments/interventions that may be helpful to patients, and as such is in the public interest. Such studies are thus not regarded as ‘inferior’ or less important than CTIMPS (Clinical Trial of an Investigational Medical Product). Indeed, some RECs are not ‘flagged’ to review CTIMPS, and, therefore focus exclusively on other research. The authors state that in order to produce reliable and valid results, a study needs to be adequately powered. It is a pity, therefore, to see them making broad inferences about the functioning of RECs on the basis of a few isolated experiences of individual researchers. However, it is no doubt true that some RECs have limited understanding of psychology and social science research. I endorse the authors’ view that a more collaborative relationship between RECs and psychology researchers is highly desirable. A positive way forward is for more psychologists (both academics and practitioners) to volunteer to become members of RECs. That way, they would be able to educate their fellow REC members (if they need education regarding psychology research…) as well as supporting appropriate ethical psychology research. I have been an expert member on a London REC for some time, and our REC has two psychologist members. I would be surprised if any psychologists who have presented their proposed research to us feel that our committee has not understood the nature of the research, the need for adequately powered studies, or the difference between a CTIMP and psychological research.